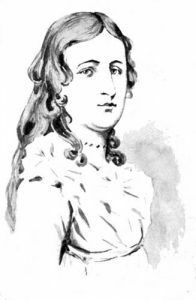 Deborah Sampson Gannett (1760-1827) – The first known woman to impersonate a man in the U.S. Army, Deborah served as a soldier during the American Revolution. Born in Plympton, Massachusetts on December 17, 1760 to Jonathan and Deborah Bradford Sampson, she was the oldest of seven children. While still a very young girl, her father allegedly drowned in a shipwreck and mother and children were left destitute. The children were sent to live in different households. Later, in 1770, she became an indentured servant with a family that had ten sons. There, she learned both women’s work, but also many predominantly male tasks, such as carpentry, plowing fields, and caring for stock. Self-taught, she learned to read and developed a keen interest in politics and the events leading up to the American Revolution. When she was 18 she was released from indentured service and first taught school. However, obviously not to her liking, in May 1782, she disguised herself as a man and volunteered to join the army. Calling herself Robert Shirtliffe, she soon joined the Light Infantry Company of the 4th Massachusetts Regiment. For the next three years, she served in various capacities and was wounded twice, once with a sword cut to the side of her head and a few months later, receiving a shot through the shoulder. In 1783 she was promoted and spent seven months serving as a waiter to General John Patterson. During the summer of 1783, Deborah took ill with a fever and the doctor who cared for her discovered her identity but did not betray her secret. A few months later; however, she was ordered to carry a letter to General Washington, at which time, she was sure she would be discovered. However, though he said nothing, he gave her an honorable discharge, a note with some advice, and enough money to get her home. No longer a soldier, Samson returned to her life as a woman and married a man named Benjamin Gannett in April 1785 and the pair had three children. In the meantime, some of her back pay had been withheld from her because she was a woman. Later, however, she was granted the back pay and several years later, was granted pension privileges. She gave a number of lectures regarding her experiences in the army over the years. Deborah Sampson died at the age of 67 on April 29, 1827, and was buried at the Rock Ridge Cemetery, in Norfolk County, Massachusetts.